This Courvoisier cognac-drizzled cupcake is an absolute steal, amirite? What requires the work of one cake designer and two pastry chefs, hours of planning, and two days of labor? 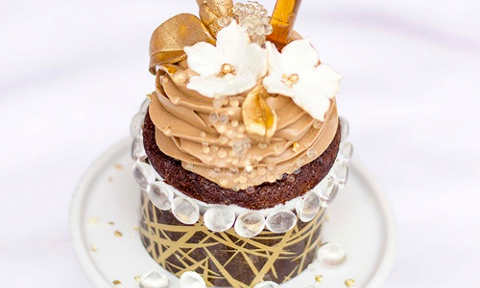 The most extravagant cupcake the world has ever seen, that’s what. It all started when Lisa Sanguedolce, owner of Toronto’s Le Dolci bakery, received the (outrageous) request of a man who wanted to build a cupcake for his wife’s birthday. What Sanguedolce presented was this golden, floral-themed, $900-cupcake that incorporated all of the wife’s favorite things. Two of the most prominent features? Diamonds and booze, because, duh. Personally, we would’ve preferred a bottle of Krug and some Gucci Mane-style ice, but that’s just us.